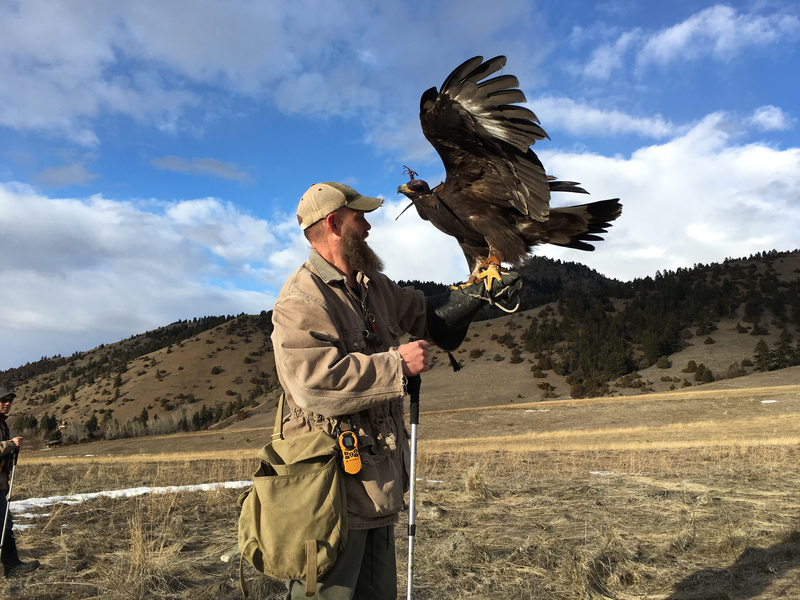 At the grassy base edge of mountain range is a place humans teach eagles to hunt again, where falconers help rescued golden eagles recover and gain back strength. Rocky Connell is pictured with his latest rehabilitation client, Lilith, a golden eagle. Rocky Connell is one of those falconers. He’s a 46-year-old son of a veterinarian, and grew up around animals in need of help. In this country golden eagles cannot be taken from the wild except in the case of rescue; a reality which makes the opportunity for him to fly and hopefully hunt with one a privilege. An aspiring falconer must apprentice for at least two years before owning a bird, and must follow strict federal and state regulations as to what species they are permitted to trap or own. Over the years Rocky has put in countless hundreds of hours, and paid his dues. Rocky’s day job leaves room for a life dedicated to birds. He bakes bread full-time for the Bozeman Co-op. Five days a week, his shift starts at four a.m., not ending until around one in the afternoon. By then his large light colored beard is usually made lighter with a dusting of bleached flour. He left work on Feb. 22 with plenty of daylight to fly his own bird, a 2-year-old merlin named Akila, on the way to exercise the eagle he trains. His much smaller merlin rides leather hooded on a perch behind Rocky in the cab of his green Toyota Tundra on the dirt road driving to the golden eagle facility. She’s a song bird hunter, and Rocky helps her target invasive European starlings. His son, Rainer rides in the truck with the merlin and his father. Rainer is in his early 20s and a falconer as well. In the summer he works flying apolmado falcons in Washington state, protecting orchards from songbirds. In the winter, for now, he lives with his dad and grows his own darker beard. He has two birds of his own, and helps with the eagle. Moving along the last mile of dirt road before the facility, the truck flushes several meadow larks and a flock of starlings from a field. They don’t go very far, and Rocky pulls off to the side of the road, by the ditch. While he gets Akila ready, Rainer keeps an eye on her prey. Most of the birds flew off again, but a group of four starlings stays huddled on the roof of a nearby building. Only patches of sky are a brilliantly clear blue, and it’s deceptively cold out in the wind when the moving clouds cover the sun. Rocky sets Akila loose from his glove, and she flies straight for the starlings. They break away from the building immediately, and Akila settles to perch where they’d been. Rocky signals her back, and she comes to his whistle. He gets back into his truck and with the window down, and begins to drive. Akila flies fast ahead, and waits on a fence post until the truck reaches her. After the truck stops, Rocky gets out and, “throws a lure,” a leather flap shaped like a wing with meat tied to it. He swings it around above his head, and his merlin returns to him. She makes a few looping passes before landing softly on his glove, and he puts her hood back on. She returns to her perch. Rocky talks about raptors like they’re Roman goddesses, mystical entities of great beauty and power. He says falconry is the art keeping your bird at the precise optimal weight, and of showing a bird you’re there to work for them. Any day a bird of his has a good hunt is a good day to Rocky. When he takes on a new bird, he sees it to be, in many ways, like an intense and budding romance. Lilith is his most recent and formidable affair; a nine-and-a-half pound female golden eagle hatched in the wild last spring. She was found starving to death in a farmer’s field in the fall. They took her to a raptor rescue center in Helena, before Rocky picked her up and brought her to the facility. Many birds simply leave the nest unprepared to feed themselves, and combat harsh environmental realities. Lilith now has a large white room to herself with perches beside thickly barred windows. From one of them she can see her training ground at her mountain’s base. She can see the deer that pique her curiosity and the rabbits that fuel her killer instinct, and the large spruce, juniper and Douglas fir trees she calls her perches. Rocky prepares his equipment then goes into the room with Lilith. There’s a live video feed of her room playing outside the door on a tablet. Rocky weighs her, and slips a hood over her head. It’s time to fly. The idea is to give her a chance to perch up high, before luring her down out over the pasture, where she can practice soaring, something she has yet to do. Once she is free, she makes for a spruce tree, but quickly takes flight again, and cruises downhill to a high point above the pasture, landing on the ground. Rocky and Rainer decide to slip below her several hundred meters where they throw a lure in hopes of bringing her to it. She is fast to take flight and poses stiff in a glide all the way down to Rocky. She takes the lure. Rocky successfully gets her back to his glove, and they debrief. They go over every aspect of what happened in training; what they did, what the bird did, and how could they do better next time. How could they plan better? What goals did they achieve for the day, and what should the goals be for tomorrow? Ideally, she’ll be hunting wild hares soon. The next day is sunnier with a milder but consistent wind. Rocky comments that it could be a great day for soaring. There are no clouds in the sky, and the sun’s radiance is detectable through the breeze. Rocky heads up the hill with Lilith on his arm. He carries a trekking pole that he uses as a rest beneath her when he needs it. Ranier goes downhill. He has a lure with him. When they’re all set, 400 meters apart, Lilith is released. She goes around to her trees and perches. Rocky calls over the radio and tell Rainer to throw his lure. As he begins whipping it around and blowing his whistle, the eagle lifts off. Instead of descending close to the ground she gathers speed, but remains high. As she nears Ranier, he pulls in and puts away the lure and Lilith circles above. Keeping her elevation, even gaining it at times, Lilith circles overhead three times before returning back upslope to perch near Rocky. She soared. She used the wind to gain altitude and she held it. They reward her with fresh meat. She flew more comfortably the second day; flying for longer, soaring in and around trees at high speed. The ultimate goal is that she gets strength and practice enough hunt her own game, and on the fourth flight of the day Rocky wants to see her hit a lure like it were her prey. From a spruce on the hillside Lilith goes airborne, immediately circling to rise on a thermal and soar. Rainer throws his lure. She banks and covers that 400 meters in 19 seconds. That’s an average speed of about 50 miles per hour. She glides in low, using a rolling hill for cover, passing in front of me, then arching up above Rainer at the last second, rolling over and stooping back down onto the lure. Rocky practically ran down the hill after her, cheering her on. According to their website, the Montana Raptor Conservation Center rescued 234 raptors in 2015 alone. But falconers also play significant roles within the world of raptor conservation, as best evidenced in the case of the peregrine falcon. According to their website, the Peregrine Fund’s efforts to conserve habitat, conduct research and educate the public, helped save the species from near extinction over the last four decades. However, falconers often have conflicting views of raptor rehabilitation with organizations like the MRCC who outwardly criticize the sport, in part because falconry often involves taking birds from the wild. What’s lesser known is that falconers also often release their birds back into the wild, and allow them to fly and hunt uncaged. Rocky released his first bird, a large female redtailed hawk, two years ago. They were in the same area where he’d trapped her two years prior. She was healthy, an adept hunter. The day he released her, she soared with two fellow redtails, potentially her kin, for several hours. Rocky watched them long enough to know the time had come. He removed her jesses, the leather straps around her ankles, and simply resisted calling her back down to him. She soared on and out of his life. Because of Rocky’s commitment, Lilith soared for what could have been the first time in her life. Every day he does it to witness and enable her glory. Someday, when the time is right for Lilith, he’ll set her free to soar with other eagles.